A large utility plant in Western Pennsylvania, with three identical boilers, experienced a tube leak in one of Unit #3’s horizontal reheater pendants. The cause for the failure was oxidation pitting due to out of service corrosion. 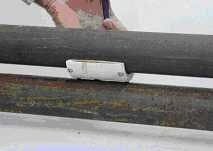 Destructive samples showed ID pitting as small as 3/16” diameter occurring on the bottom half of the tubes. 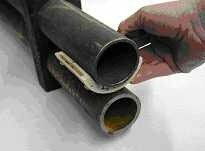 The customer’s goal was to inspect the bottom of as many tubes that could be accessed with limited cleaning. Due to the short outage span, no sandblasting or hydroblasting could be performed. The tubes were blown off with air. Some light wire brushing was also performed. The tube specifications are 2.5” OD, 0.180” wall, T22 material. TesTex, Inc. developed a Low Frequency Electromagnetic Technique (LFET) Low Profile Scanner that is 0.6” thick and is contoured to the 2.5” diameter tubes. A calibration tube was machined with 3/16” pits to verify detection capabilities and provide accurate flaw sizing. TesTex manufactured 5 Low Profile Scanners with plans to place 4 teams on day shift and on night shift to inspect as much as possible in a 24 hour period. There were 158 pendants in the reheater. The inspection area was dictated by accessibility. The reheater design allowed access to 6 areas for inspection. Some scaffolding was installed at the inlet header. Most of the inspection was performed in crawl spaces where the tubes above and below were accessible. A total of 58 tubes were identified with pits ranging from 20-30% wall loss to >70% wall loss. A few of the tubes had several pits along a 3’ area. A tube identified as having >70% wall loss was cut out. This cut-out contained a pit with less than .054” wall remaining or >70% wall loss. Fifty-eight flaws in the plant’s Unit #3 Reheater were located and repaired. Thus, 58 potential forced outages were avoided. According to plant personnel, it takes a minimum of 72 hours to bring the boiler down and repair a tube leak on the 700mw unit. Boilers #1 and #2 were tested in the same areas where flaws were found in Unit #3. No signs of pitting were found.